Louis Cameron Gossett Jr. was born on 27 May 1936, in Brooklyn, New York City USA, of Sierra Leonean and Liberian ancestry. Lou is an actor, perhaps still best known for being a part of the 1982 film “An Officer and a Gentleman” which won him an Academy Award, but all of his efforts have helped put his net worth to where it is today. How rich is Lou Gossett Jr.? As of late-2016, sources estimate a net worth that is at $1.5 million, mostly earned through a successful career in acting. He also won an Emmy Award for his work in the miniseries “Roots”, and other projects he’s done include “A Raisin in the Sun”, “Toy Soldiers”, and “The Punisher”. All of these achievements have helped ensure the position of his wealth. Gossett attended Abraham Lincoln High School and had his first acting opportunity there, becoming part of a school production entitled “You Can’t Take it with You”, after which, and partly because of a sports injury, he decided to fully pursue acting. After matriculating in 1954, he attended New York University, declining a sports scholarship to focus on acting. Eventually he would have a successful audition for Broadway’s “Take a Giant Step”. In 1959, he was cast in the production of “A Raisin in the Sun” which led to a film adaptation. This started his film career and he would later appear in “The Blacks” which became the longest running off-Broadway play of the decade. In 1965, he would be cast in the musical “Zulu and the Sazya”, but the following year he branched out and wrote the song “Handsome Johnny”, which Richie Havens would eventually record. His net worth was well established. In 1977, Lou became a part of the miniseries “Roots”, which started to boost his popularity and further his net worth. The role won him an Emmy Award and he was then given the title role in the miniseries “Sadat”. He continued his career by being part of the series “The Powers of Matthew Star”, and in the film “An Officer and a Gentleman”, which would win him an Academy Award for Best Supporting Actor, making him the first African American to do so. Thanks to the success of the film, his net worth would continue to increase with more opportunities being given to him. Gossett also does a lot of voice acting work, being part of the video game “Half-Life 2” as Vortigaunts, and also voiced Lucius Fox in “The Batman” animated show. In 2005, Lou starred in “Left Behind: World at War” and four years later would use his voice talents in “The Word of Promise” production. One of his latest works is the drama “Boiling Pot” which proved to be controversial as it tackled racism in college campuses across the country during the 2008 presidential election. For his personal life, it is known that Gossett has been married three times, firstly to Hattie Glascoe 1967 but it was annulled a year later. His second marriage was to Christina Mangosing in 1973 and they had a son but then divorced in 1975 His third marriage was to Cyndi James-Reese in 1987 – they adopted a son, but would divorce in 1992. In 2010, Lou announced that he was battling through prostate cancer, and had managed to catch the disease early; he was able to make a full recovery. 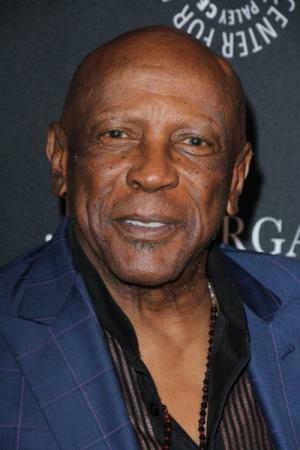 Full Name Louis Gossett Jr.
1 [on preparing to portray the historical life of black people] You have to make an adjustment. I remember my elders and how we handled the hard times, and there's a lot of feeling that comes out of it, a lot of music that comes out of it. We got from one day to the next with a sense of humanity, joie de vivre - whatever it takes to get from night to the next day. You have to learn how to withstand it and get through it, break through it like water off a duck's back. 2 I'm the first generation born in the north after the migration from the south to the north, so I grew up in a very diverse neighborhood. My parents knew all about lynchings and all that kind of stuff, but I didn't know anything about it. They kept an eye on me , they worried about me and slowly and surely I survived and was able to get them to this wonderful mentality of things going very well. 3 [in 1983] Here I am, a black actor getting attention, and suddenly I'm asked to do "Othello." I'll do "Richard III, I'll do "Macbeth," but I don't have any interest in doing "Othello." James Earl Jones is good enough for me. 4 [on his 9 year-old son Satie in 1983] As much energy and love I put into my acting, I put into him. I have to be careful he's not my shadow, that he can create his own personality and be what he wants. That means walking a tightrope as a parent. 5 [on about his absence from 1970s blaxploitation films] Sometimes it was by choice, sometimes by coincidence. I did have other jobs during that entire era. 6 [on his receiving an Academy Award] The only Oscar I ever knew was a cousin. 7 [1983 interview] What happens in real life should be represented on the screen, but it isn't. Just glance inside a restaurant, or look out onto the streets. You will see more black people there than you do on the screen. In that sense the movies are letting us down. 8 [2010, on coming close to being killed by the Manson Family] When I was living in Laurel Canyon, we were there to welcome The Rolling Stones, and The Beatles were in town, and they were staying at the Chateau Marmont Hotel. We had taken pictures and were talking and stuff. Roman Polanski was there, and his wife, she was pregnant. It was a nice bunch of people. The Mamas and the Papas were there, the people I hung out with most of the time. So they said, "Everybody's going to have late coffee and breakfast at Roman Polanski's house". Right around the corner is where my house is, so I'm going to go to the house, take a shower, and put on some fresh clothes. I take a shower, put on some fresh clothes, and turn on the TV, and there the news is. So I dodged a bullet. 9 [2010, on The Landlord (1970)] Hal Ashby was a great man. A great man. I had some great experiences with Hal and Diana Sands and Beau Bridges and Pearl Bailey and Lee Grant. We had a very good time. For a lot of us, it was our first major motion picture, and we had a ball. An absolute ball. My favorite scene is when "Copee" goes crazy. It's a magic scene there. I was very satisfied with that performance. That entire movie. 10 [2010, on winning the Oscar for An Officer and a Gentleman (1982)] It did create a lot of opportunities, but I thought there would be more. I thought it would be a windfall. But it wasn't. It was what it was. It only affected me for a little while, and then it stopped affecting me. I just come out the other end. 11 [2010, on An Officer and a Gentleman (1982)] When I went in for that part, I don't know what my agent said, but when I knocked on the door, he looked at me and said, "You've got the part". I didn't have to do anything. It was a case of "be careful what you ask for", because now that I've got the part, I've really got to deliver the goods. I took 30 days and went down to San Diego, where I studied drill instructors and studied with them for 28 of those days. Then I came to the set with one of them, and when I showed up, I said I was the DI. I had to move away from them, because they didn't take me seriously. So I didn't hang out with anybody. I just moved away...It took a bit of a toll. But I was getting ready to do anything in order to do that performance. It was my shot, and I was doing as much as I could to do a good performance. 12 [2010, on filming Enemy Mine (1985)] That was a challenge. I prefer a challenge, because when you've done that, you've done something. That was something where nobody could see my face or my eyes; I was giving somebody a performance through that makeup. That was six months in Germany. A lot of pain in the eyes and stuff. 13 The Lord may not come when you want Him, but he's always going to be there on time. 14 I can do more than anyone suspects. I pride myself on my versatility. It took 32 years of difficult parts, second leads, villains and juveniles. The Oscar changed the quality of the roles I was being offered. 15 When I'm offered a role, I look at what I think I can do with it. I look to see if I can project myself into it. 16 If a role isn't different, it's not worth doing. 1 He was awarded the 1970 Los Angeles Drama Critics Circle Award for Distinguished Performance for the play, "Murderous Angels" at the Mark Taper Forum Theatre in Los Angeles, California. 2 Attended Brooklyn's Abraham Lincoln High School. 3 Gossett was drafted by the New York Knickerbockers. 4 He was cast in his Oscar winning role in An Officer and a Gentleman (1982) after Jack Nicholson turned down the role, and none of the other actors who the producers wanted proved available at the time. Screenwriter Douglas Day Stewart then did research on a Navy base in Pensacola, Florida and found out the top drill instructors they had there were African-American. Upon realizing this, Gossett was cast in what can now arguably be his best remembered role. 5 Father of Satie Gossett. 6 In the early 1990s, Rich Little offered him the chance to be his opening act in Las Vegas, but he turned it down, a move that he deeply regrets. He sent his wife, Cyndi James Gossett, in his place. 7 Received a star on the Hollywood Walk of Fame at 7000 Hollywood Boulevard in Hollywood, California on May 20, 1992. 8 Attended Woodstock. He said, "I wanted to be in the now. There were a whole bunch of us there, in the now. Anywhere anything exciting was happening, we were there.". 9 (February 8, 2010) Diagnosed with prostate cancer. 10 His foundation, Eracism, is devoted to eradicating racism. 11 First cousin of Robert Gossett. 12 Was originally cast as Gale Sayers in the television movie Brian's Song (1971). Just days before shooting began, Gossett tore his Achilles' tendon while working out for the film. The studio execs scrambled and quickly hired Billy Dee Williams as a replacement. Gossett, depressed over missing his "shot", was promised by producer David L. Wolper the first great role that came along. About six years later, Wolper called Gossett to play Fiddler in Roots (1977), the Emmy Award-winning role that made him a star. 13 Was considered for the role of Lieutenant Ted Traxler in The Terminator (1984), which went to Paul Winfield. 14 He was the first male to be shown giving birth on screen, as Jeriba "Jerry" Shigan in Enemy Mine (1985). 15 Along with Stacy Keach, he was one of two actors considered for the role of the SGC's new commanding officer, General Hank Landry, on Stargate SG-1 (1997). The role instead went to Beau Bridges, however Gossett was cast as a Jaffa leader named Gerak. 16 He and his ex-wife Cyndi James Gossett have an adopted son. 17 Was named as "King of Brooklyn" at the Welcome Back to Brooklyn Festival in 1990. 18 Conceived and co-wrote the well known song "Handsome Johnny" with Richie Havens. As the opening act for the original Woodstock, Havens performed "Handsome Johnny," as the 8th song in that historic first set. According to Havens, "...(Gossett) had gotten it up to the 'Dunkirk war'...I brought it up to date..." (From liner notes in The Best of Richie Havens CD, 1993). Taking Woodstock 2009 writer: "Handsome Johnny"
Woodstock 1970 Documentary writer: "Handsome Johnny"
Love Songs 1999 TV Movie segment "Love Song for Champ, A"
Where Have All the Fathers Gone 2015 Documentary Lou Gossett Jr.
1992 Star on the Walk of Fame Walk of Fame Motion Picture On 20 May 1992. At 7000 Hollywood Blvd.